The TURNOUT™ PRO is the only duffel specifically designed and built by firefighters to properly store and carry both structural and wildland turnout gear between firehouses or between jobs. This monster sized bag will carry your helmet, Nomex™ jacket, bunker pants, gloves, boots, standby clothing for emergency and USAR type response teams, and even has 2 inside lockable pocket for your personal valuables. 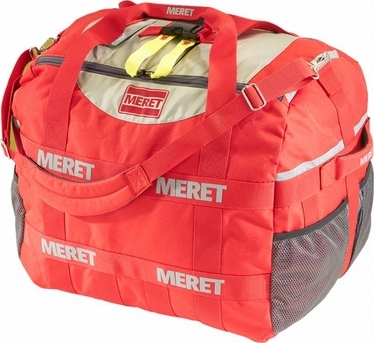 And this bag is over-constructed for superior strength; built from 1200 and 1680 denier water and stain resistant TPE, and wrapped by four 2 inch wide webbing straps to support the weight of your gear, and more. A wide-mouth opening allows easy and quick access to large equipment. And four exterior mesh pockets provide storage for small items or your favorite bottled beverage. The TURNOUT™ PRO is available in red and tactical black (non- reflective). Product Dimensions: Outside Dimensions: 22" x 20.5" x 19"